American coin silver open work napkin ring made from 6 Guatemalan 2 Real coins, c.1900. This beautiful napkin ring containing six coins soldered together, with one coin face being blank and uncut. Dimensions: 1 3/4" - 1 1/4", weight 33 grams or 1.1 ozs Troy. The excellent original condition and clear detail, with no monograms, removals, repairs or alterations, make this an especially attractive offering. The soft, warm, original antique finish is present, with no buffing or machine polishing. American sterling silver serving bowl having high relief applied Wild Rose flowers and open work vines with fabulous detail, c.1900. 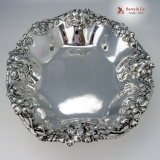 This ornate, oval bowl is 10 1/2" long 8 1/4" wide, 2" deep and weighs 360 grams or 11.6 ozs. Troy. The soft, warm, original finish is present, with no buffing or machine polishing. The excellent original condition and clear, crisp detail, with no monograms, removals, repairs or alterations, make this an especially attractive offering. 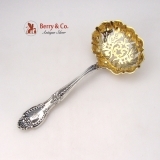 American sterling silver berry or casserole serving spoon in the Strawberry Vine pattern by Tiffany and Company Silversmiths, c.1875. This elegant, pierced handle, nicely detailed spoon has a gilt, kidney shaped bowl and is 9 1/2" long, weighing 128 grams or 4.1 ozs. Troy. The back of the end of the handle has a period script monogram: EMV. The monogram is barely noticeable and not located in the Monogrammed as described above, the soft, warm, original finish is present, with no buffing or machine polishing. The excellent original condition and clear detail, with no removals, repairs or alterations, make this an especially attractive offering. Offered elsewhere for $680, our price of $495 is as special as the piece itself. American sterling silver sugar sifter ladle in the Richelieu pattern by Tiffany and Company Silversmiths, Patent 1892, with a period script monogram: MH on the front of the handle. This lovely pierced, gilt bowl ladle is 5 3/4" long and weighs 43 grams or 1.4 ozs. Troy. Monogrammed as described above, the soft, warm, original finish is present, with no buffing or machine polishing. The excellent original condition and clear detail, with no removals, repairs or alterations, make this an especially attractive offering. Offered elsewhere for $500, our price of $375 is as special as the piece itself. American sterling silver long sauce or cream ladle in the Richelieu pattern by Tiffany and Company Silversmiths, Patent 1892, with a period script monogram: MH on the front of the handle. This lovely scalloped, gilt bowl ladle is 7 1/2" long and weighs 48 grams or 1.5 ozs. Troy. Monogrammed as described above, the soft, warm, original finish is present, with no buffing or machine polishing. The excellent original condition and clear detail, with no removals, repairs or alterations, make this an especially attractive offering. Offered elsewhere for $375, our price of $245 is as special as the piece itself. American sterling silver over the cup tea strainer in the Les Cinq Fleur pattern by Reed and Barton Silversmiths, Patent May 22, 1900. 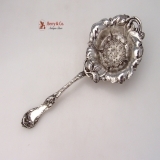 This elegant, ornate tea strainer is 7" long and weighs 43 grams or 1.4 ozs. Troy. The soft, warm, original finish is present, with no buffing or machine polishing. The excellent original condition and clear, crisp detail, with no monograms, removals, repairs or alterations, make this an especially attractive offering. 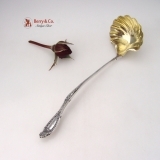 Offered elsewhere for $495, our price of $395 is as special as the piece itself. 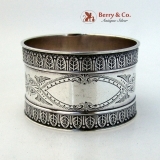 American sterling silver napkin ring having wide bands of floral Repousse work on a tapered cylindrical body by the National Silver Company, c.1900. This elegant napkin ring is 2" in diameter, 1 5/8" tall and weighs 26 grams. It has a richly gilt interior. The soft, warm, original finish is present, with no buffing or machine polishing. The excellent original condition and clear, crisp detail, with no monograms, removals, repairs or alterations, make this an especially attractive offering. American sterling silver napkin ring, 1940. This elegant, yet simple napkin ring measures 1 3/4" in diameter, 1/2" tall, weighing 9 grams. 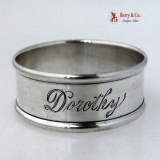 Inscribed Dorothy 25 Years. The soft, warm, original finish is present, with no buffing or machine polishing. The excellent original condition and clear, crisp detail, with no monograms, removals, repairs or alterations, make this an especially attractive offering. 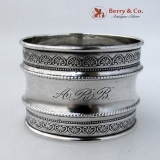 American sterling silver Palmette and beaded border napkin ring, monogrammed, in period script: ARB, c.1880. This handsome pinched body napkin ring has a matte finish and is 1 3/4" in diameter, 1 5/8" tall, weighing19 grams. Monogrammed as described above, the soft, warm, original finish is present, with no buffing or machine polishing. The excellent original condition and clear detail, with no removals, repairs or alterations, make this an especially attractive offering. 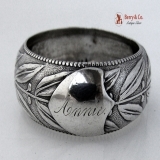 American coin silver Laurel leaf and berry napkin ring with a stippled background, beaded edged and an applied shield shaped cartouche inscribed: Annie, c.1860. This early, unusual napkin ring is 2 1/8" in diameter, 5/8" in diameter and weighs 15 grams. Inscribed as described above, the soft, warm, original finish is present, with no buffing or machine polishing. The excellent original condition and clear detail, with no removals, repairs or alterations, make this an especially attractive offering. 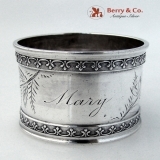 American coin silver napkin ring with applied Fleur de Lis rims and Aesthetic floral and foliate engravings surrounding a period inscription: Mary, c.1875. Weighing 35 grams 1.1 ozs. Troy, this attractive napkin ring is 1 13/16" in diameter and 1 1/2" tall. Inscribed as described above, the soft, warm, original finish is present, with no buffing or machine polishing. The excellent original condition and clear detail, with no removals, repairs or alterations, make this an especially attractive offering. 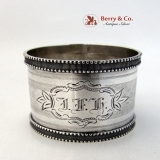 American coin silver engine turned napkin ring with double beaded rims and a central scroll and foliate bordered cartouche containing a period, script monogram: JFH, c.1875. This handsome napkin ring is 1 3/4" in diameter, 1 1/2" tall and weighs 24 grams. Monogrammed as described above, the soft, warm, original finish is present, with no buffing or machine polishing. The excellent original condition and clear detail, with no removals, repairs or alterations, make this an especially attractive offering. 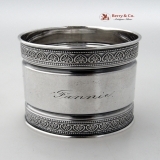 American coin silver Aesthetic napkin ring with engraved Ivy decorations and applied dart rims, c.1875. This elegant napkin ring is 1 3/4" in diameter, 1 1/4" tall and weighs 26 grams. The soft, warm, original finish is present, with no buffing or machine polishing. The excellent original condition and clear, crisp detail, with no monograms, removals, repairs or alterations, make this an especially attractive offering. 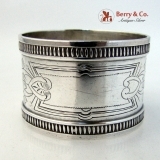 American coin silver Aesthetic napkin ring with Fern and dart applied rims and aesthetic Ivy engravings on each side of a shaped scroll blank cartouche by Wood and Hughes, c.1875. This elegant napkin ring is 1 3/4" in diameter, 1 1/4" tall and weighs 28 grams. The soft, warm, original finish is present, with no buffing or machine polishing. The excellent original condition and clear, crisp detail, with no monograms, removals, repairs or alterations, make this an especially attractive offering. 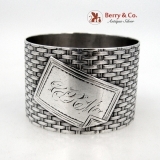 American coin silver Aesthetic gilt, matte finished napkin ring with engraved Ivy vines on each side of an engraved, shaped rectangular cartouche. Weighing 43 grams or 1.4 ozs. 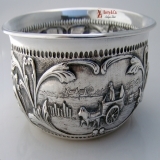 Troy, this impressive and unusual napkin ring is 1 7/8" in diameter and 1 5/8" tall. The soft, warm, original finish is present, with no buffing or machine polishing. The excellent original condition and clear, crisp detail, with no monograms, removals, repairs or alterations, make this an especially attractive offering. 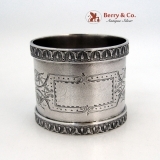 American coin silver Aesthetic matte finished napkin ring with applied Belleflower borders, engraved Belleflowers on each side of a shaped, blank cartouche, c.1875. Weighing 44 grams or 1.4 ozs. Troy, this handsome napkin ring is 1 13/16" in diameter and 1 13/16" tall. The soft, warm, original finish is present, with no buffing or machine polishing. The excellent original condition and clear, crisp detail, with no monograms, removals, repairs or alterations, make this an especially attractive offering. American coin silver Basket Weave napkin ring with an applied trompe l′oeil folded edge plaque with the period monogram CRM, c.1875. Weighing 28 grams, this special napkin ring is 1 5/8" in diameter and 1 1/4" tall. Monogrammed as described above, the soft, warm, original finish is present, with no buffing or machine polishing. The excellent original condition and clear detail, with no removals, repairs or alterations, make this an especially attractive offering. 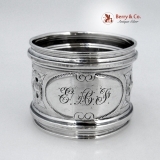 American coin silver Repousse napkin ring set on a stippled background with a large scroll bordered central cartouche containing an ornate, period script monogram: EAF. Weighing 20 grams, this attractive napkin ring is 2" in diameter and 1 1/2" tall. Monogrammed as described above, the soft, warm, original finish is present, with no buffing or machine polishing. The excellent original condition and clear detail, with no removals, repairs or alterations, make this an especially attractive offering. 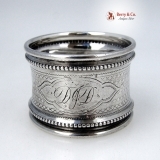 American coin silver Repousse napkin ring set on a stippled background with a large scroll bordered central cartouche containing an ornate, period script monogram: CS. 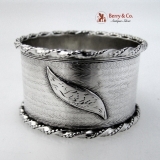 Weighing 20 grams, this attractive napkin ring is 2" in diameter and 1 1/2" tall. Monogrammed as described above, the soft, warm, original finish is present, with no buffing or machine polishing. The excellent original condition and clear detail, with no removals, repairs or alterations, make this an especially attractive offering. American coin silver engine turned beaded border napkin ring with a shaped cartouche containing the period monogram DJD, c.1870. This elegant napkin ring weighs 24 grams and is 1 7/8" in diameter and 1 1/4" tall. Monogrammed as described above, the soft, warm, original finish is present, with no buffing or machine polishing. The excellent original condition and clear detail, with no removals, repairs or alterations, make this an especially attractive offering. 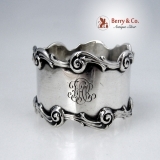 American sterling silver Baroque scroll napkin ring by the National Silver Company, c.1900 with an ornate, period script monogram: FAR. 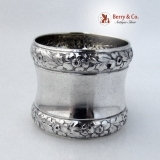 This elegant napkin ring weighs 30 grams and is 1 7/8" in diameter and 1 1/4" tall. Monogrammed as described above, the soft, warm, original finish is present, with no buffing or machine polishing. The excellent original condition and clear detail, with no removals, repairs or alterations, make this an especially attractive offering. 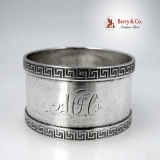 American coin silver Greek Key border napkin ring with a period script monogram: MJE, c.18870. 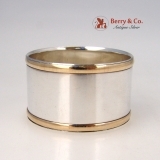 This handsome napkin ring is 2" in diameter, 1" tall and weighs 33 grams or 1.1 ozs. Troy. Monogrammed as described above, the soft, warm, original finish is present, with no buffing or machine polishing. The excellent original condition and clear detail, with no removals, repairs or alterations, make this an especially attractive offering. 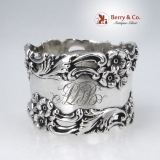 American sterling silver Baroque floral open work scroll napkin ring by Simons Brothers of Philadelphia, c.1890, with an ornate, period script monogram: ADB. This elegant napkin ring has applied floral, foliate and open work scroll borders and is 2" in diameter, 1 1/2" tall and weighs 32 grams or 1 oz. Troy. Monogrammed as described above, the soft, warm, original finish is present, with no buffing or machine polishing. The excellent original condition and clear detail, with no removals, repairs or alterations, make this an especially attractive offering. American Italian sterling silver napkin ring with gold band borders made for Tiffany and Company by Kohler and Schaefer Silversmiths of Milan Italy, c.1970. This elegant, Art Moderne napkin ring is 1 3/4" in diameter, 1 1/8" tall and weighs 32 grams or 1 oz. Troy. The soft, warm, original finish is present, with no buffing or machine polishing. The excellent original condition and clear, crisp detail, with no monograms, removals, repairs or alterations, make this an especially attractive offering. 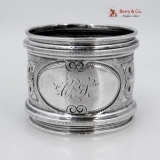 American coin silver engine turned napkin ring having twisted ribbon and bead applied rims and a shaped, applied cartouche containing the inscription: Lizzie, c.1860. This delightfully attractive napkin ring is 2" in diameter ,1 1/4" tall and weighs 27 grams. Inscribed as described above, the soft, warm, original finish is present, with no buffing or machine polishing. The excellent original condition and clear detail, with no removals, repairs or alterations, make this an especially attractive offering. European silver pate on brass figural spice box or Etrog in the form of a Rooster, Nineteenth Century, with a maker′s mark of ES with a tree in between the letters inside a shield shaped cartouche. This superb, large box has excellent detail, with the head of the Rooster serving as the lid. 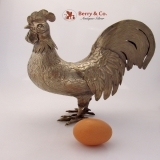 As with the Rooster Inkwell, this beauty is guaranteed not to lay an egg. At 8 1/4" tall and 9" from beak to tail feathers, this is a very impressive figural spice box. The finish is original, with good color and only light wear. 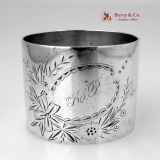 American sterling silver floral engraved napkin ring, c.1880, with a period script monogram: KP on the front within a floral engraved cartouche and a later inscription: Jerry Sept. 11th, 1925 on the back. This interesting and large napkin ring weighs 60 grams or 1.9 ozs. Troy, is 1 15/16" ion diameter and 1 3/4" tall. Monogrammed and inscribed as described above, the soft, warm, original finish is present, with no buffing or machine polishing. The excellent original condition and clear detail, with no removals, repairs or alterations, make this an especially attractive offering. 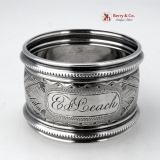 American coin silver beaded border Aesthetic engraved napkin ring inscribed: E F Leach, c,1875. 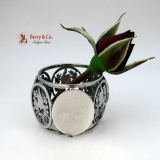 This lovely, matte finished napkin ring is 1 5/8z" in diameter, 1 1/8" tall and weighs 11 grams. Inscribed as described above, the soft, warm, original finish is present, with no buffing or machine polishing. The excellent original condition and clear detail, with no removals, repairs or alterations, make this an especially attractive offering.